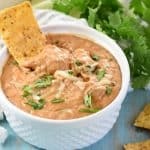 Instant Pot Refried Beans are creamy, flavorful, and effortless to make in the pressure cooker…a perfect side dish for all of your favorite Mexican recipes! We eat a lot of Tex-Mex at our house, y’all. And if we go out to eat, odds are about 90% that we’re going to end up at a Mexican restaurant. It’s a cuisine that I know my whole family will eat every time, and as a fan of chips and queso (and margaritas) myself, I’m never one to argue.? 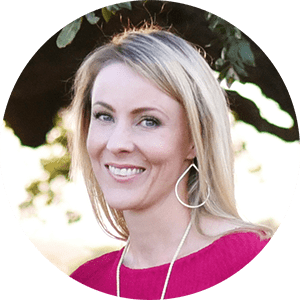 So as a result, I’ve assembled quite a collection of Tex-Mex recipes over the years, from tortillas to salsa to tacos to enchiladas to rice to beans to so much more. And while I previously posted (and recently updated with a video!) a recipe for delicious Slow Cooker Charro Beans, today I’m sharing the latest addition to our family’s repertoire of Mexican food favorites: from-scratch Instant Pot Refried Beans! 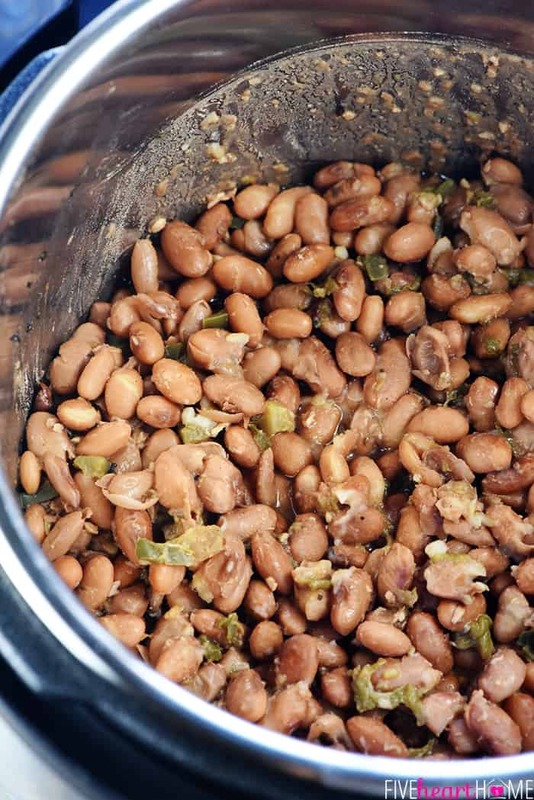 Tossing everything in the pressure cooker makes this recipe is SO EASY…you don’t even need to pre-soak your pintos. 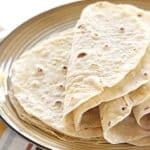 But even the very minimal effort of this recipe is worth it, because the results are about a hundred times more flavorful than any refried beans you can get from a can. What I really love about an Instant Pot (and what differentiates it from most slow cookers) is the sauté feature. This means that, if I wish, I can quickly sauté or sear or brown any particular ingredients before sealing the pressure cooker and letting it do its thing. This provides a great opportunity to add more flavor to a recipe without even dirtying an extra pot or pan! In the case of these Instant Pot Refried Beans, you’ll start out by sautéing some onion, garlic, and jalapeño until softened. 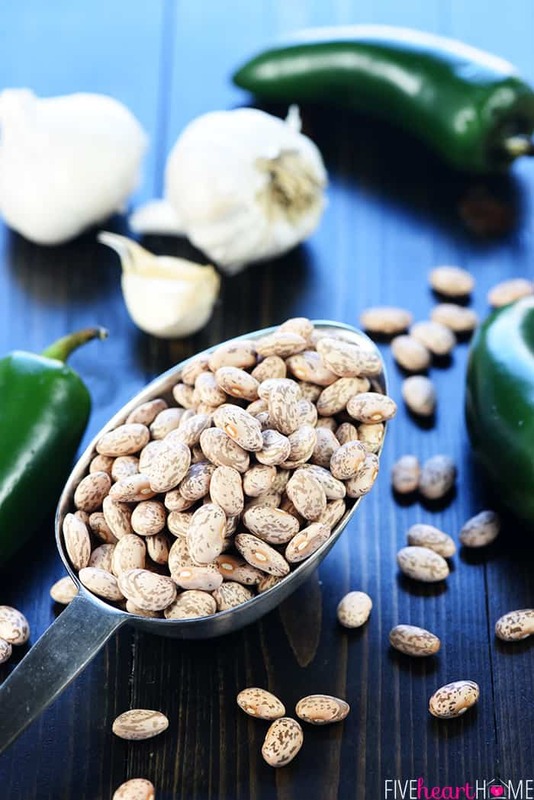 Then add dry pinto beans and a variety of other ingredients for FLAVOR, FLAVOR, FLAVOR: broth instead of water, fresh minced jalapeño, diced green chiles, vinegar, cumin, oregano, salt, and pepper. From there, simply seal your pressure cooker, set it to cook for 50 minutes, and then allow the pressure to naturally release. 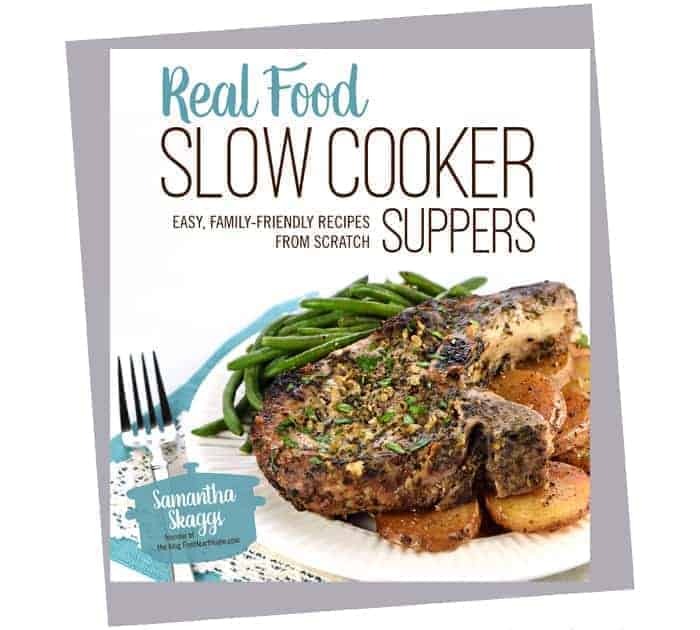 So it’s not that this recipe is exactly quick, per se, but it’s still quicker than cooking dry beans in the slow cooker or on the stovetop. 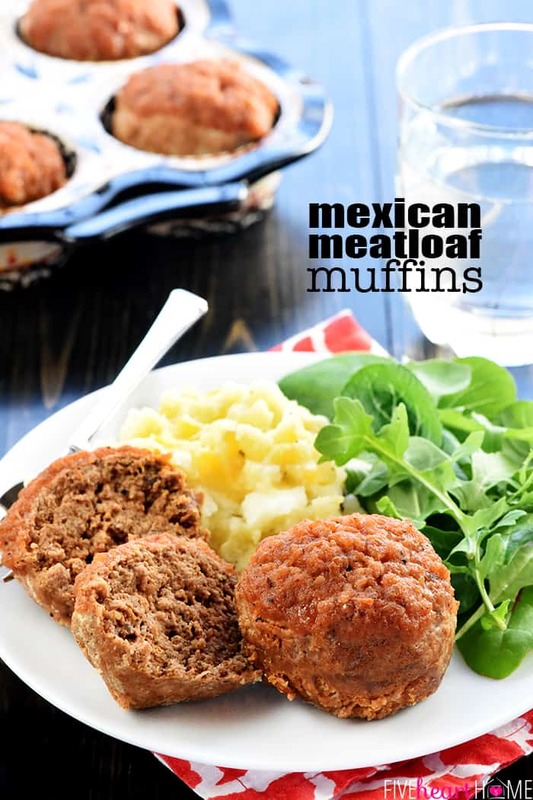 And because these Instant Pot Refried Beans are entirely hands-off while cooking, you can spend that “free time” preparing the rest of you Mexican feast…or, you know, prop up your feet up in front of the TV and eat some bon-bons for an hour or so. 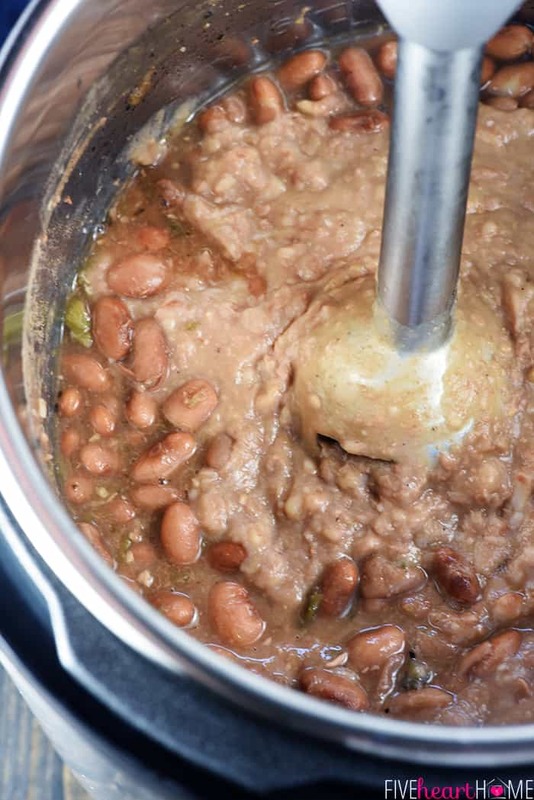 Once the beans are done, use a ladle to transfer as much cooking liquid as possible to a large measuring cup. Then drain off and discard the rest of the liquid. With the beans back in the Instant Pot insert, use an immersion blender to puree them until smooth, adding as much cooking liquid back as necessary for your preferred consistency (I used about 3/4 cup liquid, but you’ll likely need anywhere from 1/2 to 1 cup of liquid). Finally, adjust the seasonings to taste, adding extra salt, pepper, and if you like, another splash of vinegar. Drumroll please…your Instant Pot Refried Beans are DONE! 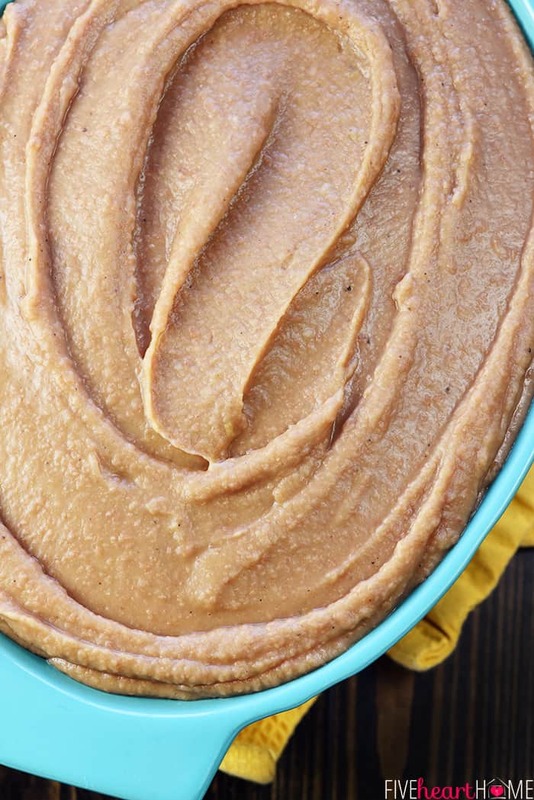 That’s right, friends…you don’t actually have to fry your refried beans. In fact, many folks don’t. But if you prefer to include this step, you certainly may do so! Just heat your favorite oil (such as olive oil, lard, or bacon grease ←my pick for the most flavorful) in a large frying pan. Then add the pureed beans plus 3 or 4 additional tablespoons of that aforementioned leftover cooking liquid. Cook for several minutes, stirring regularly, until the beans have thickened and are heated through. Voilà…fried beans! eaten with a spoon? ? But I’d argue that it’s a small risk to take for such a bountiful reward! Here’s the Instant Pot I used. Feel free to tweak the ingredients to your liking. I don’t care for (AKA, loathe) onion, so I don’t actually add it to my refried beans…I increase the garlic instead. By removing the seeds and membranes, the jalapeño contributes flavor without heat. 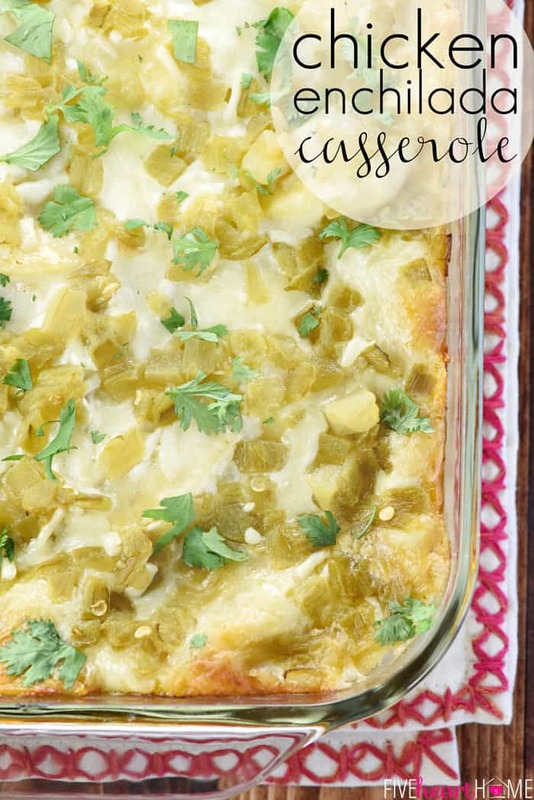 The green chiles in this recipe aren’t spicy either. So for beans with a kick, include the whole jalapeño, seeds and membranes intact. You may make your refried beans with water, but I think cooking them in broth or stock adds another layer of flavor. I usually use Better Than Bouillon Organic Chicken Base plus water in place of store-bought or homemade broth. For vegan beans, you may use vegetable broth instead. If you don’t have Mexican oregano on hand, you can use regular (Mediterranean) oregano. 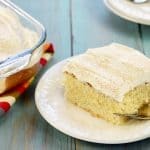 I like the taste of apple cider vinegar in this recipe, but if you prefer, you can use plain white vinegar instead. I highly recommend investing in an immersion blender. I use mine all the time…it’s quick and easy to use and it doesn’t result in a mess (such as dirtying up a blender). But if you don’t have an immersion blender, you can mash your refried beans by hand using a potato masher. Or you can allow your beans to cool a good bit, transfer them in small batches to a blender or food processor, and carefully puree them until smooth. 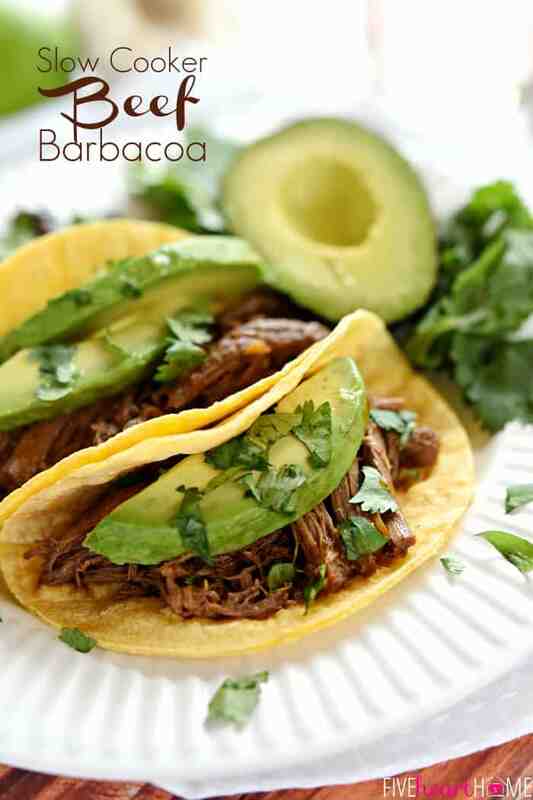 You may garnish refried beans (served as a side dish) with grated cheese, fresh cilantro, or chopped green onions. They’re also good drizzled with salsa! 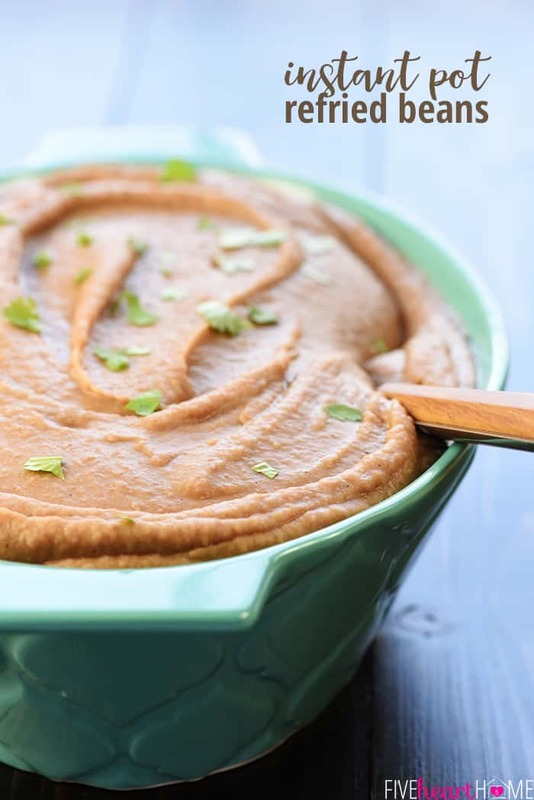 Leftover refried beans may be refrigerated for up to a week or frozen for up to 3 months. 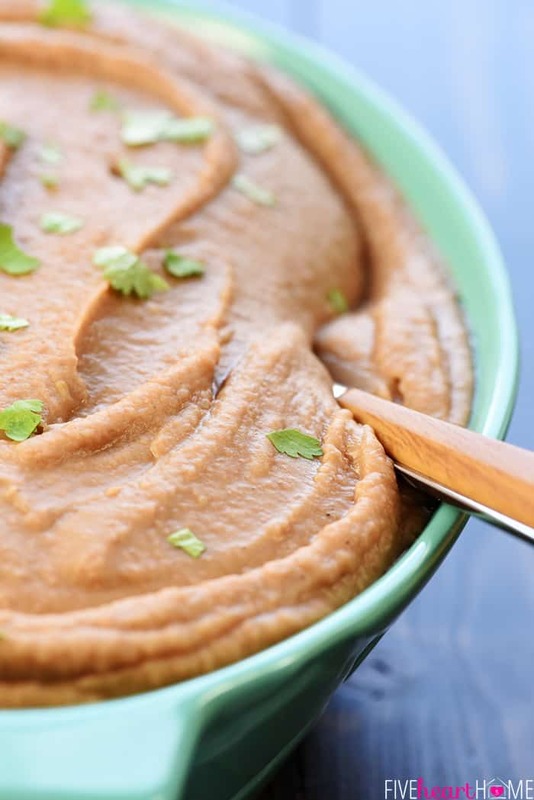 To freeze refried beans, I recommend portioning them into freezer-thickness, zip-top plastic bags…squish the beans into a thin, flat layer, and freeze the bags laying flat. Once the bags of refried beans are frozen, they can easily be stacked in the freezer. They also thaw more quickly this way. 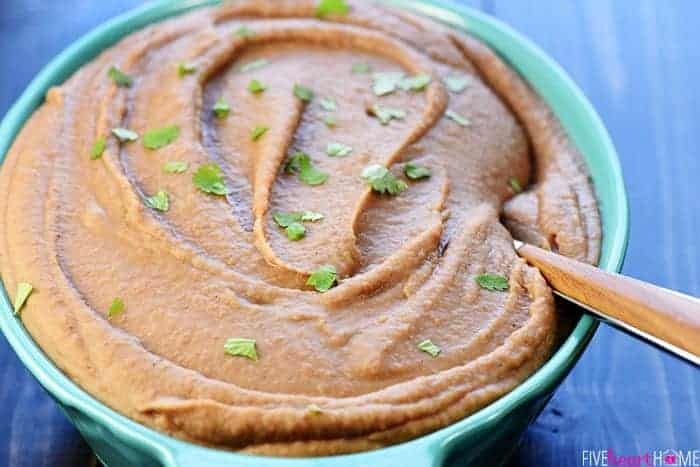 Instant Pot Refried Beans are creamy, flavorful, and effortless to make in the pressure cooker...a perfect side dish for all of your favorite Mexican recipes! Measure the olive oil into an 8-quart (or larger) Instant Pot insert and set to the SAUTÉ function. Once the oil is hot, add the onion, garlic, and jalapeño; cook, stirring regularly, for 2 minutes. Press CANCEL after sautéing. Add the beans, green chiles, broth, vinegar, cumin, Mexican oregano, salt, and pepper to the pot; stir to combine. Seal the lid according to the owner's manual and cook on HIGH pressure for 50 minutes. When the timer is done, allow the pressure to release naturally for 20 minutes, then carefully vent to release the remaining pressure (consult your owner's manual for more specific instructions). Open the lid and use a ladle to remove as much cooking liquid as possible to a large measuring cup or bowl. Drain the beans into a colander to discard of the remaining liquid, and transfer the beans back to the Instant Pot insert. 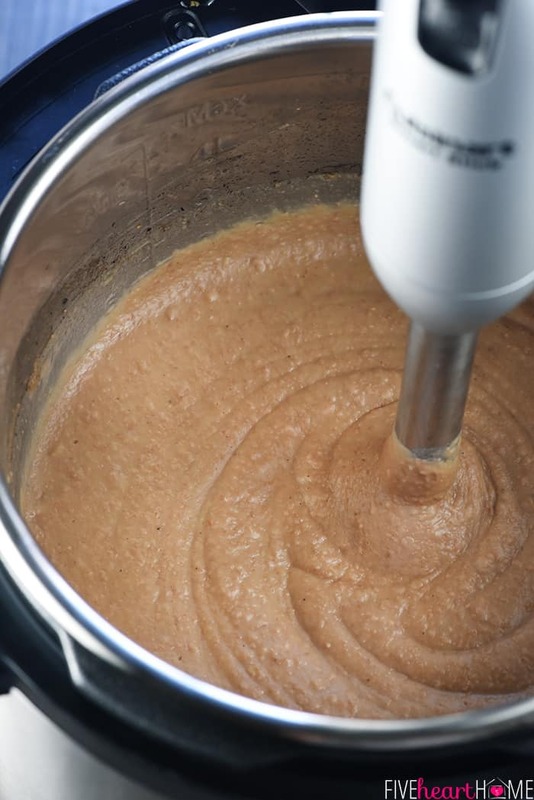 Use an immersion blender to puree the beans until smooth and creamy, slowly and gradually adding cooking liquid back to the beans until your desired consistency is reached (typically between 1/2 to 1 cup total liquid). Adjust the seasonings to taste, adding more salt, pepper, or vinegar, if desired. Serve hot. Thank you so much for this recipe. It was easy to make and turned out great! 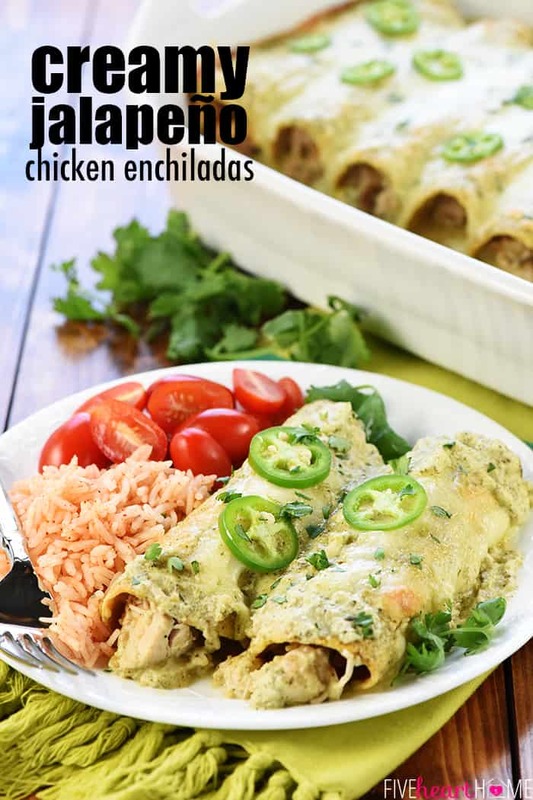 I usually judge a Mexican Food place by it’s refried beans, so I had high expectations when I made this recipe. Let me tell you…it was EXCELLENT! I added more broth both in the cooking process and afterwards when blending the beans. I’m not sure why mine were so dry, but the flavor was perfection! Thank you! 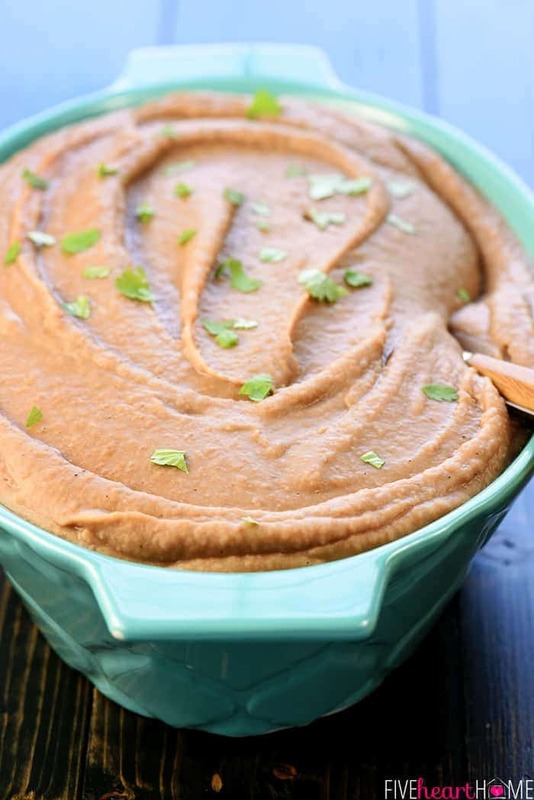 This recipe makes the best refried beans! I will not be buying canned anymore. Making chicken nachos with it for dinner tonight….or maybe just refried bean nachos with cheese….? Wow delish!!!!! I actually followed exact recipe but used Black Beans and it’s so yummy and my kiddos who don’t even like Beans just asked for seconds! 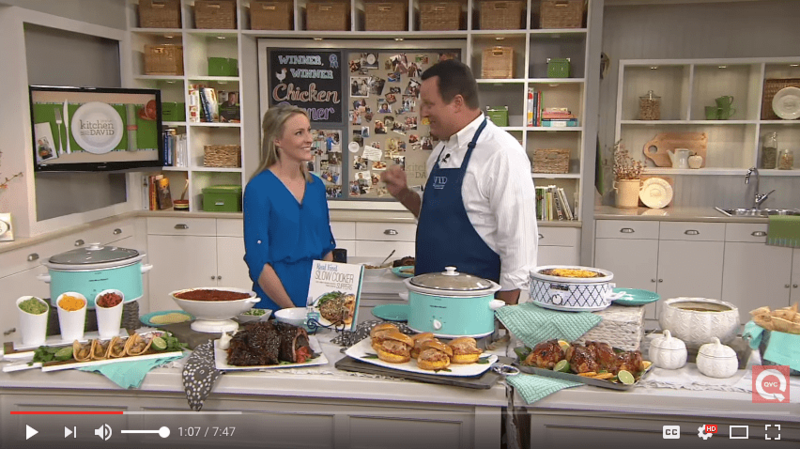 Great to know this recipe works with black beans, Robin…thanks for sharing and I’m glad your family enjoyed! Can this be made in a regular old pressure cooker? I don’t have an “Instant Pot”. Great recipe! I didn’t have jalapenos or onions on hand, so I used dried chopped onions. 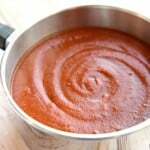 I also added a tablespoon of tomato paste because we like that flavor. I also only pureed 3/4 of it because we do like a little texture. My husband enjoyed them. I have tried countless Instant Pot/Slow Cooker beans and all of them have been flavorless and not appealing. This recipe yielded the most delicious beans I have EVER tasted. I followed the receipe exactly except reduced the Vinegar to 1 Tablespoon and it came out with so much flavor and wonderful texture. We eat beans two to three times a week in my home and this will be the only we ever use. THAT good- thank you for the recipe! These look delicious! I want to try making them for a large gathering. Is it okay to double the recipe, or is that too much to cook at once for an Instant Pot?